Chances are good that you'll be firing up your grill this Memorial Day weekend, you and 71% of Americans. Chances are also good you'll be grilling hot dogs, hamburgers, steak and corn. But how about grilling some unusual suspects, like watermelon, sweet potatoes, even cake? What foods do you love to grill? Please share with us here or online at the U-T! Salting watermelon is also apparently delicious. I need to try grilling it too! Your grilled watermelon looks absolutely luscious! No grilling for me. Apartment dweller. :-( Oh well, going on vacation starting Sunday anyway. I couldn't grill even if I had a yard. I really do love the flavors in your chipotle-lime sweet potatoes. I must do a non-grill adaption of that ASAP! I've done grilled Guacamole for many years now and just love the smoky edge it takes on. 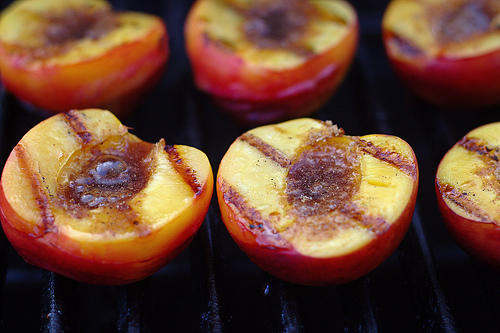 My favorite unusual item to grill is angel food cake, and then of course, it has to be topped with grilled fruit like peaches, bananas or nectarines. Or all three. A few summers ago, I grilled just about everything that crossed my plate. It was amazing and delicious fun. Wow! I love to grill fruit like peaches and pears but I never thought to grill watermelon! Love the salad. I love all grilled veggies and grilled king crab legs, grilled hearts of romaine and fish. I once tried grilling pizza using a baking stone in a BBQ. The bottom became crisp before the top was ready-still need to work on it. sdoc-You can bake them in the oven or use a grill pan on top of the stove. Enjoy! kate-Grilled guacamole is a revelation, isn't it? So happy to hear you're a grilling maverick! gwen-You'd be amazed! Love grilled romaine too. Ooh, so good. sarah-I've never used a stone on the grill. Interesting. Let me know if you have success. Good luck!